A mother holds up an empty cooking pot as she crouches alongside her daughter inside their makeshift home at a settlement near the town of Ainabo, Somalia, Thursday 9 March 2017. 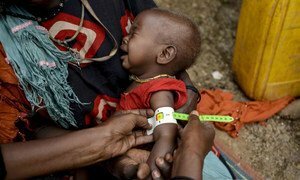 Expressing its grave concern about the threat of famine facing some 20 million people in conflict-affected Yemen, Somalia, South Sudan and north-east Nigeria, the United Nations Security Council today requested the Secretary-General to provide early warning when a conflict could lead to famine. Through the adoption of a Presidential Statement, the 15-member body also requested the Secretary-General to provide an oral briefing in October 2017 on impediments to an effective response to the risk of famine in these countries, and make specific recommendations on how to address country-specific impediments in order to enable a more robust short- and long-term response. The Council emphasized, with deep concern, that ongoing conflicts and violence are “a major cause of famine” as they have devastating humanitarian consequences and hinder an effective humanitarian response in the short, medium and long term. Deploring that in these four countries, certain parties have “failed to ensure unfettered and sustained access” for deliveries of vital food assistance as well as other forms of humanitarian aid, the Council reiterated its calls on all parties to allow the safe, timely and unhindered access for humanitarian assistance to all areas and to facilitate access for essential imports of food, fuel and medical supplies into each country, and their distribution throughout. The Council further urged all parties to protect civilian infrastructure which is critical to the delivery of humanitarian aid in the affected countries. The Council expressed its readiness to continue to support the Secretary-General's call to action to avert famine in conflict-affected countries and commits to engage constructively on his specific recommendations. Sounding the alarm on behalf of more than 20 million people in South Sudan, Somalia, Yemen, and north-east Nigeria facing devastating levels of food insecurity, Secretary-General António Guterres joined other top United Nations officials today calling for “strong and urgent” action from the international community to help the already-fragile countries avert catastrophe.